LG 65LA970W review | What Hi-Fi? LG was one of the first companies out of the traps with 4K TV. This 65in 65LA970W follows in the footsteps of the 84in monster, the LG 84LM960V, which arrived in our testing rooms with a whopping £22,500 price tag. The LG 65LA970W shows how the second-generation of Ultra HD TVs has brought the technology in to slightly more realistic territory: a 65in set for £5500. We’re keen to cut straight to the chase so, armed with a USB stick and media server, we thrust some native 4K content onto the '970W. The detail provided by the hike in resolution is very noticeable, and very welcome. You can’t help but be impressed by the extra subtlety. Our USB stick contains 4K content of Paris and St Petersburg, which looks really crisp and stable with motion, and our server-based 4K clip of Will Smith’s After Earth has a similar wow factor. But as impressive as it is, there’s better quality on offer from other 4K TVs. 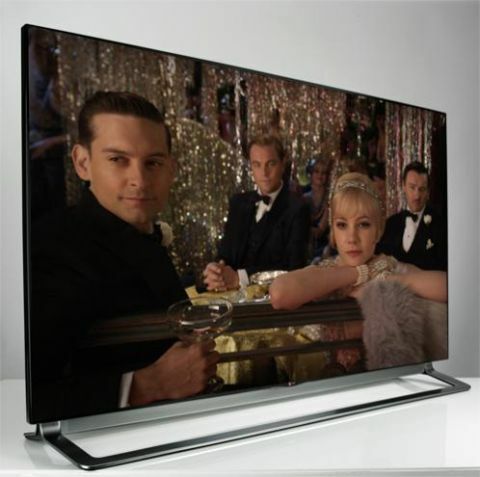 The UHD is glossier and a touch more natural on the Philips 65PFL9708 and, to a lesser extent, the Samsung UE65F9000. The LG’s image looks a little less sharp and there’s a bit more on-screen noise to deal with. This is more noticeable when you force the 65LA970W to upscale standard-def Freeview and DVDs. Watch Mission: Impossible – Ghost Protocol and there’s a lack of robustness when the TV comes to defining the lines of Dubai’s massive Burj Khalifa building. Switch to HD with The Lone Ranger on Blu-ray and, as the Commanche and cavalry do battle by moonlight, the LG uncovers a good level of detail. Rockfaces look dark, yet the edges of outcrops are drawn with just enough sharpness. Inside the mountain tunnel the LG shows just enough shadow detail to keep the set competitive. We’re really taken with the LG’s 3D performance. Play Hugo and the picture comes to life. There’s a great sense of depth, and although 3D effects such as the snowflakes falling in front of you are obvious, they’re not annoying or over-done. But, even when optimised, colours appear a little too vivid next to rival sets. Besides 4K, the LG’s other main talking point is the motorised sliding speaker that magics into view when you power up the set. It’s more than just a cool gimmick as it allows the sound to fire directly outwards towards the listener. The speaker sounds clear, lively and is a definite step up from other LG TVs we’ve heard recently. LG’s Smart TV platform isn’t quite as comprehensive as others when it comes to catch-up TV, but there’s a nice variety of apps, including Deezer, vTuner internet radio, BBC Sport and Netflix. And LG’s offering has been bolstered by a 12-month exclusive deal for Sky’s Now TV pay-per-view service. The 65LA970W has the normal connections and specifications you’d expect, including wi-fi, USB inputs, and Freeview HD and satellite tuners. LG only provides three HDMI sockets, though, which might seem a little miserly when a lot of rivals stretch to four. But it’s really only an issue if you’ve a huge arsenal of kit and no AV receiver to route it all through. A slightly bigger issue could be the width of the stand. It’s almost as wide as the screen and overhung our test racks. Overall, then, it’s a mixed bag for the LG 65LA970W. The 4K footage is an inevitable eye-opener, but other 4K TVs we've seen do better with detail and depth. The 3D performance with Blu-ray is something to write home about, though – which is good news for legacy disc collections.